I'm not seeing how a cacher who likes to complete challenges would be put off by having challenge stars. It actually seems that many would really like them as it would be a quick way to see how many challenges that they've completed. I did not refer to a system where challenge stars are offered in addition, but a system where found it logs for challenge caches get a different and less significant meaning. Further, unlinking the challenge from the container find would create a much higher number of people going after challenges because they wouldn't be tied to just those challenge caches that are placed in their immediate caching area. Going after challenge caches that still exist by then, yes. But if the old ones do not remain as they are, many would get archived and much fewer new ones would be hidden. Fewer challenge caches might be placed, but I suspect that far more unique challenges would be created if more people who qualifed were able to log the challenage as having been completed. This thread is not discussing any such system. The Found It log would be exactly what it says it is. People aiming for challenges would not be aiming solely for Find logs. And no one has suggested anything would happen to the old ones. You know, there is this concept called "grandfathering". Maybe, but I think the audience would be quite a different one. New ones might be attracted, but many fans of the old concept would end up disappointed. That's up to interpretation. I think it does. It still means that the found it logs for challenge caches get cheaper. But grandfathering is not always applied when Groundspeak changes something (for example, they archived all locationless caches). Are you imbuing Find Logs with "less significant meaning" because they now mean what they are called, and are now achievable by people who don't care to do challenges? The only place they lose meaning is that they are no longer WIGAS logs. But the "loss" is placed into a new location for those who care about it. There is zero loss of meaning in the process of geocaching, and challenge caching. That's like saying that oranges have less value because the apples they were mixed with for so long are now given their own fruit pile in the grocery aisle. It's like you're saying the apples were actually oranges all along, which they weren't. It's merely that before, you would have to get an orange and an apple from the same pile. If you didn't want an apple, too bad, they're paired together. But now if you want an apple you can get one from its own pile (providing you still take an orange), and people who want oranges only don't have to take the apple too. Because the challenge caches are an ALR, then the Find log means more than just 'found it'. So the rules say you can't 'find it' without qualifying. Separating the two means that you can 'find' the cache, but you can still qualify and earn the challenge stars if you want. That's the process, even if you somehow perceive the Find Log as somehow 'losing' value by splitting off the challenge ALR into its own metric. Only if you forcefully want to make the Find log mean more than "Found". And like above, I also wager that most challenge cachers (at worst) do not care. Currently it's the only way it works, so it's fine to require the ALR in order to earn the smiley they desire. People who don't care about challenges don't do challenge caches. People who care about challenges, I believe, will do them whether they get rewarded by challenge stars or the (current) WIGAS smiley. There was an explicit reason for archiving all locationless caches. Not relevant to this feature. I can conceive of zero feasible reason to archive existing challenge caches. Yes, because everyone can get them. If it were just the name of the log type, I rather think that a separate log type like the change to attended for events (but still counted as finds) would better serve the purpose of what most current owners of challenge caches have in mind. That's not a WIGAS issue at all. Finds for difficult puzzle caches also lose value as soon the final coordinates are entered into spoiler data bases. The typical reaction to this in my corner of the world is archival or moving the cache to another location (which is not an option with non qualifying logs for challenge caches). Into a metric only few of those who like the present challenge caches will care about at all. Currently it's the only way it works, so it's fine to require the ALR in order to earn the smiley they desire. People who don't care about challenges don't do challenge caches. People who care about challenges, I believe, will do them whether they get rewarded by challenge stars or the (current) WIGAS smiley. The key is that challenges are distinguished from physical caches. You seem to ignore postings by cachers like fizzymagic and others at all. They clearly state that that they will not stay interested into challenges when the reward are challenge stars. Some current challenge cache owners stated clearly (here and at other places) that their challenge caches do not make sense for them under the challenge star system. between the find and the qualification. Those however who really see the challenge requirement as a geocaching related ALR will not be happy with the challenge star system. That's the second time fizzymagic's opinion has been referenced. However, I'm not seeing any posts from him in this thread. It was just an example, however. It appears to me that the challenge star system mainly appeals to those who do not like the current system. > Are you imbuing Find Logs with "less significant meaning" because they now mean what they are called, and are now achievable by people who don't care to do challenges? Yes, because everyone can get them. Finds, yes, because the physical caches can be found. If it were just the name of the log type, I rather think that a separate log type like the change to attended for events (but still counted as finds) would better serve the purpose of what most current owners of challenge caches have in mind. That does not address the meaning of the Find log in context of physical caches. Unless you advocate renaming the "Found It" log across the entire system. On the contrary, this proposal does include a new log type, which is accurately representative of its name. > The only place they lose meaning is that they are no longer WIGAS logs. But the "loss" is placed into a new location for those who care about it. There is zero loss of meaning in the process of geocaching, and challenge caching. That's not a WIGAS issue at all. Saying it's not doesn't make it so . Finds for difficult puzzle caches also lose value as soon the final coordinates are entered into spoiler data bases. As long as Groundspeak doesn't advocate or promote spoiler databases, that's irrelevant. We're talking about Groundspeak's system. ...Which has nothing to do with Challenge Caches. On gc.com, you can log a mystery cache found, whether or not you have solved a prerequisite puzzle. On gc.com, you cannot log a challenge cache as found if you have not completed the challenge. The two cache concepts are not identical. Evidence? No? Opinion/prediction? Hey, let's debate opinions! Also, for my own part, I'm not interested in whether individuals here may or may not like a proposal that would affect the masses - I'm more interested in why or why not, and attempting to find solutions for those concerns (especially if accompanied by evidence as to why it's applicable to the masses, not just individuals) instead of throwing up my hands and giving up. That's how I like to approach a problem. I tried to explain you before that I think that those challenge cache owners who currently use challenge caches because there is no other means to propose challenges to other cachers, will be quite happy with the separation between the find and the qualification. Those however who really see the challenge requirement as a geocaching related ALR will not be happy with the challenge star system. And I do not understand your logic behind that statement. It appears to me that the challenge star system mainly appeals to those who do not like the current system. What I do not like is the very common angsty comments belittling challenge caches and people wanting to log them found (because they found them) but don't want to qualify. I could just say "too bad, that's the way things are". But rather I'd like to explore possible solutions that can make challenge caching work for everyone. My theory is that the people agitating for this cannot be happy unless they are actively searching for a way to ruin somebody else's enjoyment. That, and they consider themselves morally superior, sneering that they "feel sorry" for anyone who doesn't agree with them. Every single one of the proposed "solutions" is horrible. Most don't even rise above the minimum threshold of not being stupid, but even those that do are still poorly-thought-out and would ruin challenge caches for many thousands of others. Are you suggesting that you agree that my motivation for proposing this solution is to ruin everyone else's enjoyment? No, I never said so. Unlike fizzymagic I neither own a challenge cache nor do I use them to go out of my comfort zone. is that a lot of fans of challenge caches will not equally enjoy them if the find and the qualification are separated. This actually will remove for them the essential part of challenge caches and this is what I agree upon. And the reason for that, as discussed, was that some COs might not want people to "Find" their caches if they haven't qualified. And the response to that was to allow the CO the option to require qualification in order to also post the Found. Zero change to the current process (which ONLY requires finding AND qualifying), but with the added benefit of allowing people to find caches with challenge components without qualifying. Whether 5% of 85% of the COs out there decide to go one way or another - who knows? The forum segment of the mass community is a tiny fragment, and as we can see, different regions have different caching habits and styles and etiquette. No one region can speak for all, just as no one person can speak for most. So, there was a concern raised. And an adjustment to the proposed was made to address it. 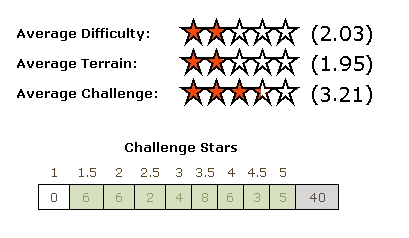 Still haven't seen any quote from someone saying they would not like challenge caching any more if this challenge rating (stars, like D and T) was implemented. I interpret fizzymagic's statement in that way. Moreover, I know several local cachers who go only out of their comfort zone to get the smilies. They would not care at all about extra points of no relevance to them. When there are multiple threads posing the same solution in search of a problem, I ought not have to post in every thread. Copying here to satisfy the demands. It seems that this could be said about every single feature request ever made. Someone identifies a thing that he believes will improve the game and he requests it. If others log the cache as a 2/2 traditional, it detracts from the experience. There would be no detraction if the others don't get the four or five Challenge Stars that would be associated with completing the requirements. In fact, the experience would be enhanced because the number of stars would be proportional to the difficulty of the challenge, as opposed to the binary yes/no dual-purpose system currently in place. The complexity of tracking separate difficulty levels for "challenge finders" and "regular finders" is likely too complex for implementation. So, leave it be. So if it were not complex, you would be in favor? The Challenge Stars system addresses all these issues perfectly. We have those already -- they are the "difficulty" stars on a puzzle cache. frinklabs, I disagree with you. You have to allow for the fact that not everyone thinks like you, and "agree to disagree." On which point, specifically? If it's a problem that can be addressed, let's address it. If it's an opinion, then yeah, agree to disagree. If it's a problem you don't want to have addressed, I think that's pretty closed minded to change... I hope it's not the latter. From my perspective, there is not a problem with the way challenge caches operate today. Implementing the suggestion creates a problem for me where, today, none exists. So, I am opposed to the suggestion. Calling me "close minded to change" does not create a positive environment for discussion. Wake me up when everyone concedes that the same idea will be applied to math puzzles, steganography images, sudoku's and other caches whose difficulty stars are reflective of the puzzle difficulty, just as the difficulty stars on the challenge caches I've found are reflective of the challenge difficulty. If people are allowed to log finds on the containers for the challenge caches without completing the challenge, then I should be allowed to log finds on the containers for the puzzle caches without solving the puzzles. Those posts were both from this thread. You are allowed to do that. Heck, it's practically the only way that I can find a puzzle cache. From my perspective, there is not a problem with the way challenge caches operate today. But from others', there are. Implementing the suggestion creates a problem for me where, today, none exists. If the new system requires a process you don't like, then we see if there's a way to address that. If not, then it becomes a matter of whether one person's dislike of a system is more important or significant than another person's dislike. The current system works nicely. Some people expressed problems with it. We're looking for a solution that can be made good for both perspectives. If in the end it's one opinion against another, well, agree to disagree; not worth debating; the higher ups would have to make their own judgement call. Calling me "close minded to change" does not create a positive environment for discussion. If you dislike any change, seemingly on principle (dismissing problems as non-problems), that's not a "positive environment for discussion" either. Wake me up when everyone concedes that the same idea will be applied to math puzzles, steganography images, sudoku's and other caches whose difficulty stars are reflective of the puzzle difficulty, just as the difficulty stars on the challenge caches I've found are reflective of the challenge difficulty. Not the same. As explained repeatedly. A challenge cache can have a puzzle and a challenge. A difficulty star at this moment is a general description of numerous aspects; primarily, the physical hide vs the challenge (I often see people describing the physical cache hide in the description because the DT stars don't reflect the physical hide but the challenge). Some people say the D should be the challenge difficulty. Some people make both D and T reflective of the challenge, depending on the challenge. The current system is fine in my opinion - but concerns have been raised about the ambiguity of the ratings system, and conflation of the found/qualified requirements for the WIGAS, and I recognize the value and reasoning in this case of clarity. If people are allowed to log finds on the containers for the challenge caches without completing the challenge, then I should be allowed to log finds on the containers for the puzzle caches without solving the puzzles. You. Can. Do. That. Now. IF you find the physical cache. You can do that now. You get brute force the find or get the coordinates from someone else that has solved the puzzle. I know of a case where a local puzzle cache creator auctioned off the solutions to all her puzzles at an event. I'm more interested in being able to get "challenge stars" because I completed a challenge. The "challenge" for me is actually discovering where a challenge caches exist within a reasonable distance that has as it's criteria something that I have completed. For example, looking at the shell1fish U.S. challenges lists I've found several "find caches in 3 or more countries" challenge (there are a couple which only require finding caches in two countries. I've found caches in 20 countries and as far as I can tell the closest "find caches in N countries" is in Michigan, about 350 miles away. The "challenge" for me is actually discovering where a challenge caches exist within a reasonable distance that has as it's criteria something that I have completed. For example, looking at the shell1fish U.S. challenges lists I've found several "find caches in 3 or more countries" challenge (there are a couple which only require finding caches in two countries. I've found caches in 20 countries and as far as I can tell the closest "find caches in N countries" is in Michigan, about 350 miles away. You come from a different direction than most of the fans of challenge caches. You wish to look out for challenge caches for which you already qualify or are close to qualify and in your case then the challenge stars would be a a sort of official recognition for your achievement. For someone like you an achievement badge system would certainly be preferable - say e.g. a badge for having found caches in 20 countries - to looking out for a challenge cache far from you that might require cache finds in 20 countries. Many real fans of challenge caches do things for qualifying they would not even have thought to do before a challenge cache with such requirements showed up somewhere in their area. You come from a different direction than most of the fans of challenge caches. Evidence? No? Opinion/prediction? Great, let's debate opinion! No true scotsman challenge cache fan! I also came across a Four Continents challenge (find caches on four different continents) that I would qualify for but the final is in a town in Germany I'll likely never visit. Like getting several of your friends to hide a cache which include nano in the title so that you can log a find on a bison tube hanging in a bush? Could well be because it might be more difficult to get it through there when in most European countries as there are less cachers there who travel a lot to other countries. 20 was just an arbitrary example. No, like being willing to travel as much as much around 900 km or even more within 48 hours to find 3 different cache types in each of the nine provinces of Austria. Or covering >300km with 20 hiking multi caches. It's also the number of countries in which I've found a cache. I haven't spent much time in that part of Europe but there's a good chance I might have a long layover in Vienna on the way home from Addis Ababa in November. As I see it, there are several flavors of challenge and that one, among other things, would be very difficult for someone that didn't live in Austria. U.S. Delorme challenges are similar. I suspect that almost all of the finders for the Colorado Delorme challenge or a "all counties in Nebraska" live in those two states respectively. There are a lot of challenges, however, that are not so dependent upon living in the area where the final cache is located (one of the many find a cache which starts with each letter of the alphabet, for example) where the idea of separating finding the cache and completing the challenge would make more sense. You're pretty good at coming up with exceptions for why some feature suggestion won't work but as I see it, they're exceptions and thus should carry little weight against a particular feature suggestion should be considered. I'm almost sorry I came up with idea of WIGAS logs. There seem to be some people who find the idea of the online 'Found Log' being the way some geocachers count coup that they are expending a lot of effort coming up with ways to "fix" it. I still say that creating a challenge star system will not change the fact that people view the find count as the goal of geocaching. Other statistic may be interesting (FTF, filling in grids, caches hidden, find rates, etc.) but the goal for many people is to add one to that smiley count. Fizzymagic's contention is that if you count challenges separately there is not the same incentive to do them as when they enable you to score another smiley. There are examples of attempts by Groundspeak to not count things as "finds" and this has led to a a much lower level of interest in those features. Some had such little interest that they've been relegated to the dustbin of "making better mistakes". Even counting something as find (Lab caches) is no guarantee of interest unless people view them as equal to all other caches and counted in other statistics. Under the current system, a completed challenge along with finding the cache is what challenge cache owners see as worthy of a smiley. Separating these will be seen as finding the cache equals a find and doing the challenge is something else that you can pass on (if you don't care about challenge stars). Sure, I "feel sorry" for those who will bypass doing a fun challenge because they don't get a regular smiley for it; but that's what geocaching has become to many people. Fizzymagic's contention is that if you count challenges separately there is not the same incentive to do them as when they enable you to score another smiley. There are examples of attempts by Groundspeak to not count things as "finds" and this has led to a a much lower level of interest in those features. There is no 'less' a smiley than as currently. Nothing is not counting something as a "find". Even counting something as find (Lab caches) is no guarantee of interest unless people view them as equal to all other caches and counted in other statistics. That's an addition to the concept of a "find", which is not the same structure or context as being proposed here. Under the current system, a completed challenge along with finding the cache is what challenge cache owners see as worthy of a smiley. Under the proposed system (at least with my suggestion) cache owners who feel that way can still do it that way. Separating these will be seen as finding the cache equals a find and doing the challenge is something else that you can pass on (if you don't care about challenge stars). Sure, I "feel sorry" for those who will bypass doing a fun challenge because they don't get a regular smiley for it; but that's what geocaching has become to many people. They get a regular smiley for finding the cache (if the CO has allowed it). I haven't spent much time in that part of Europe but there's a good chance I might have a long layover in Vienna on the way home from Addis Ababa in November. As I see it, there are several flavors of challenge and that one, among other things, would be very difficult for someone that didn't live in Austria. No, as you only need to fulfill one of the three requirements and the other two options 12 countries or three out of four quarters on the world map are not Austria specific. I do not even think that the cache owner would subject if someone logs a find with 12 countries not including Austria (I think he just meant that for Austrians 11 foreign countries are sufficient). It is trivial however to log another cache closeby when you log the final of the challenge cache. What's the real issue is that the cache is not in a central location and far from places that get a lot of tourist traffic. The cache is far from Vienna. U.S. Delorme challenges are similar. I suspect that almost all of the finders for the Colorado Delorme challenge or a "all counties in Nebraska" live in those two states respectively. There are a lot of challenges, however, that are not so dependent upon living in the area where the final cache is located (one of the many find a cache which starts with each letter of the alphabet, for example) where the idea of separating finding the cache and completing the challenge would make more sense. I have said it before that for some type of challenge caches this separation makes more sense than for others. I concentrate on these examples. All your examples refer to the US. So where's the difference. It is quite natural that one is the most familiar with local examples and has the closest interest in them. There does not exist a single challenge in my province which is of the type you have in mind. Another example which again would be referred as exception by you. To qualify you had to catch a TB (was quite challenging as the TB was in high demand and some traveled many km in vain only to realize that the TB has already moved), then to solve a puzzle and to fulfill the additional requirements with cache finds in the province of Styria (not even other Austrian cache finds counted). Also all the 360 degree challenges I know of are country or even province specific and even among the locals hardly anyone qualifies without extra work. So, yes I do understand that many among those who invest a lot of effort, time and money to qualify are not happy with the fact that everyone could score a find and the only difference are only challenge stars not many will care about. I still say that creating a challenge star system will not change the fact that people view the find count as the goal of geocaching. Other statistic may be interesting (FTF, filling in grids, caches hidden, find rates, etc.) but the goal for many people is to add one to that smiley count. Fizzymagic's contention is that if you count challenges separately there is not the same incentive to do them as when they enable you to score another smiley. I do not think that it is only the +1 aspect on the individual's find count that plays a role and not even the major role. It is rather the +1 on the number of finds of that particular cache. There are so many geocaching statistics sites out there and they are all find based and even if one new additional challenge star site would show up, it would not change the existing sites. The recognition to find a cache with only 10 finds is a different one with if the cache has 1000 finds. For those who invest a lot of money and effort into a single challenge cache, there would be much cheaper and easier ways to increase the find count by more than 1 by finding other caches. The chance to score a +1 on a special cache that is not within reach of the majority rather makes the difference I think and not the WIGAS character. It might be a similar feeling to finding caches on very high mountains that are hardly visited, but this is something which often requires special abilities. Recognition of the accomplishment would be enhanced by the Challenge Stars system. The 10 finds on the difficult cache would translate into 10 Challenge Completed logs. Those 10 cachers would have Stars added to their statistics, proportional to the difficulty of the challenge completed (instead of an arbitrary and fungible +1). Wouldn't it show a greater return on investment of that money and effort if your statistics could look like this? Personally, I do not care about such numbers at all. As regards your question, no I do not think that such numbers on the personal profile would be the greater return to most who care about the recognition aspect. The challenge star points could come from anywhere and any sort of challenge cache. That's quite different than the sort of fame that cachers can get by being among the few to manage certain caches. Of course this does not apply to challenges like filling the D/T grid. On a local level people typically do know what are the challenging caches. seperate the wheat from the chaff or something similar. Ok, that's one data point. Considering how long this thread has been running it's obvious to me that there are at least a few people t think otherwise. As is the case with any feature suggestion there is always "someone" that doesn't think it's a good idea. Even in the case of the bring back country based souvenirs thread where there is overwhelming support for the idea, not only in that thread but in many others, there have been a few people which have written that the don't care and would rather see development on something else. Should we dismiss an idea because 1-2 people don't care about it? That doesn't change with the system being proposed. If they want recognition on the cache page (in the form of a found it log that will get buried after a few others find it) they can still find the cache and get recognition for completing the challenge. If someone wants to list the specific challenges they completed there's nothing stopping them from editing their public profile page. As I see it, the total challenge stars and average challenge stars provides greater exposure to ones accomplishments. Sort of lost in this discussion is the fact that if such a system were implemented, it would essentially require a new challenge cache type (otherwise, how would the system know when challenge stars should be awarded). If there was a new challenge cache type the system could automatically generate a list of challenges one has completed. As it is now, unless you manually edit your public profile there is no way to discover what challenges you've completed without reading found it logs on all your ? caches. Once, again, the proposed system could provide greater exposure of ones accomplishments. You apparently misunderstood completely what I said. The fact that I do not care about numbers refers to all aspects of geocaching and was not an argument against the challenge star system. My comment with respect to what fans of challenge caches regard as adequate recognition was not about myself. As the country souvenir discussion shows it is completely irrelevant for Groundspeak decisions which opinions are posted on the forums for threads not opened by Groundspeak. On a local basis, it brings the greater attention if someone obtains a legitimate find for a challenging cache than if someone adds something to his/her profile. It is quite common that much more people than those who plan to do a cache watch the logs of challenging local caches. It is quite uncommon and cumbersome to compare people's profiles. You are arguing on a more global scale and not so much on a local one. Both views have its merits. For most cachers in my area the local aspect is be the greater drive in my opinion. I'm not trying to provide arguments against the challenge star system, but just try to explain why I do not think that challenge stars would increase the motivation to do challenge caches for most of those who really enjoy them in the way they are now while still not agreeing that the issue is a WIGAS issue. I think that the current system provides the better reward system for these people than the proposed new one. Of course, the new system would better motivate a number of people who are not happy with the present system. The idea would be that the challenge rating can be applied to physical caches (mystery, traditional, multi, or whatever GS decides). Reason being that some challenges are at the posted coordinates (these would be traditionals) or may require a puzzle solve (mystery). Simply applying a challenge rating would be sufficient to distinguish a standard cache from a challenge cache - both for stats and including for searches/queries/maps. So let's try to leave opinions (that bring nothing to the table) out of the discussion if they're irrelevant and just incite endless opinion debates. Bring evidence, support, reasoning, things we can work through. And no change here. There more attention if someone posts a distinguished Challenge Completed for a cache, than just a Find. Adding info (or not) to their profile is irrelevant - that can be done currently, and would still be doable with the proposed system. No change there. The proposal actually give more attention to legitimate challenge cache finds (that is, which include completion). I'm happy with the present system. I would also be motivated with the proposed system. It certainly sounds like you're trying to provide arguments against it, rather than helping hone it so it better addresses any potential issues presented with it. I'm convinced that all these discussions are hypothetical only anyway as Groundspeak will never implement something like that. That sounds hard, in comparison to the challenge caches which by and large are located at the posted coordinates on the cache page. So, to even the playing field in my analogy, either the puzzle cache coordinates must magically and automatically appear for all those users who elect to find the container without solving the puzzle, OR the challenge cache coordinates must be blurred for all those users who elect to find the container without meeting the challenge requirements. If I'm asked to brute force puzzle caches or beg for the coordinates, then treat equally all those who desire to log finds on challenge caches as if they were regular caches. You see, for me a big part of the thrill I get by logging in at a challenge cache is knowing that I'm part of a limited group of people who can visit that site, sign the log and then log an online find, because I did the hard work needed to satisfy the challenge requirements. The exclusive nature of that find is my reward for my labors. The proposal takes that thrill away, and I'll be just one more signature in a log scroll. I don't tend to enjoy four and five-star difficulty puzzles, but I imagine that those who like solving these puzzles experience a similar thrill when they visit a location where only puzzle solvers (or very lucky accidental or tagalong finders) can visit the site, sign the log and then log an online find. Their puzzle solving skills and dedicated solving work, which I lack, are rewarded through their exclusive discovery of the cache location. I would imagine that puzzle cache fans would be upset if the website made the puzzles optional in order to score "Puzzle Points" to do the cache "the hard way." They'd say "nothing was wrong with the design for puzzle caches, and we were having fun with them." I am saying the same thing for challenge caches. I will keep having fun finding them, because I won't worry about the alternative. I highly doubt that Geocaching HQ will replace the current design with "Challenge Points." a big part of the thrill I get by logging in at a challenge cache is knowing that I'm part of a limited group of people who can visit that site, sign the log and then log an online find, because I did the hard work needed to satisfy the challenge requirements. The exclusive nature of that find is my reward for my labors. With this, you'll be part of a limited group of people who can visit that site, sign the log and then log the challenge completed, because you did the hard work needed to satisfy the challenge requirements. The exclusive nature of that completed challenge is your reward for your labors. And, you'll still be distinguished on the cache page as part of that limited group of people. I imagine that those who like solving these puzzles experience a similar thrill when they visit a location where only puzzle solvers (or very lucky accidental or tagalong finders) can visit the site, sign the log and then log an online find. Not the same. You equated "accidental or tagalong finders" with legitimate finders. The current system allows for that with puzzle caches, not for challenge caches. The one point I can understand from your statements are regarding the physical log sheet - you sign it, and you can feel that you are among those people who also signed and who have completed the challenge. But even that is not so! Someone can find and sign the cache without qualifying; no thrill there for you. Someone can also qualify not yet having found the cache. Signatures on the physical log sheet are not some certain metric of who has a) solved the puzzle, or qualified for the challenge. The cache listing with this proposal will identify who's who. Their puzzle solving skills and dedicated solving work, which I lack, are rewarded through their exclusive discovery of the cache location. Not necessarily. As you mentioned above. I would imagine that puzzle cache fans would be upset if the website made the puzzles optional in order to score "Puzzle Points" to do the cache "the hard way." And people who don't do the puzzles still get rewarded "puzzle points" (D stars). My mistake. I misread the description. In that case, I would qualify for the challenge portion of the cache. And that's a point I've been trying to make. There may many challenges for which I could qualify but because the notion of challenge caches hasn't caught on in my area, there are essentially no (okay, I think there are 3) challenge cache finals withing 50 miles. Challenge stars would provide a little more equity in benefits for those that don't have the luxury if living in a cache rich area where new caches are published every day and new challenges are created. I can't disagree with that. Even if only 20% of all challenge caches saw some benefit from the proposed system, and the other 80% remained the same, that's still a net benefit over the status quo. If the cost of development is not prohibitive, even a net benefit for 20% may be enough of a justification or implementing such a system. I used U.S. examples because shell1fish has compiled several bookmark lists of challenge caches in the U.S. which includes several thousand challenge caches. If there were such a list for Europe, and some way to classify challenge caches into different types there might be some metrics which could be used to quantify the actual potential benefit of the proposed system. The difference is in the weight of evidence. Two or three anecdotal examples carry less weight as evidence to support or dispute an argument than demonstrating statistical significance. I'm not about to go through those thousands of challenge caches on those bookmark list to handpick a few examples for which ones would benefit by the proposed system, but it it appears that a significant percentage would, then the weight of that evidence refutes a few hand picked examples which would not benefit. I'm confused. When did it become a rule that only people who agreed with a suggestion could post in a thread? I like challenge caches the way they are. Please don't argue with me about how I feel and don't insist that it is more important to please unhappy people than it is to continue to please satisfied customers. Forum post are inherently a poor way to gauge dissatisfaction since very few people visit a forum to say positive things. They come to ask for help or to complain. It's the nature of the beast. Team Taran, threads can go WAY off course if people simply come and complain without adding anything to the conversation. That's the point. Everyone is entitled to an opinion, and it's perfectly fine to post opinions, good or bad. But it comes to a point where if nothing is being added, it can derail the discussion and drown the signal with noise. We know people may not like an idea. That's always the case. But a productive discussion, a thread we hope to remain respectful, insightful, and positive, is made of back and forth, progression, not repetitive negativity. Voice your opinion. You're not wrong for having it. No one is degrading you for it. But let's see if there's a solution, instead of just constantly saying, in spirit, no, there is no solution and this is a stupid idea I don't like. It's borderline trolling (especially if the intent is to drown out signal with noise). While there's no "forum rule" against who can post what opinions, there's certainly etiquette for positive discussion, and the hopes a thread doesn't get shut down because tensions rise from circular arguments and derail it. No one told anyone to stop posting. And I've seen a few threads (several on the same topic) where a few people on one side of the issue didn't want to listen to rationale arguments and turned it into ad hominim attacks and resulting in a moderator closing the thread. In those cases, those making the most noise "win" because stifling the discussion achieved the results they wanted. I make a lot of suggestions in this forum with zero expectations that any of them will ever be implemented. The best I have hoped for is to come up with a suggestion that is close to something on which they were working, in secret (as always). Unfortunately, I can't think like The Team and promulgate non-optional ways to jam the InstaYouTwitFace chaff into aesthetically-static "Web Two Point Oh" "Cloud" "Apps"
Meanwhile, I am wondering if there's a way I can notify a mod to rename this thread to [FEATURE] Challenge Stars? The title didn't really need to be changed. Sure some people are still arguing over whether challenge should be logged as WIGAS instead of Found It. But if you count challenges separately from finds then it seems the stars are just an enhancement. I think it was because many challenges caches maybe 1/1 but are rated higher based on the caches found in the challenge part. So maybe the idea is for challenge caches to have two ratings - one for the challenge cache itself and the other for doing the challenge. But it seems really unnecessary to count stars. You get one WIGAS point for finding a cache regardless of ratings, so why wouldn't you get one challenge WIGAS for doing the challenge. If someone is using a challenge cache to fill in a grid for a fizzy challenge, this extra complication is going to cause problems. "I got my 5/1 grid from doing challenge cache X. But it only counted as 1/1 since that is the cache rating." If you want to make suggestion that have a chance of being implemented, keep them simple. Challenges exist because they have a fairly simple concept (albeit made somewhat more complicated when other ALRs were banned) that didn't require any new code. Even just having a separate cache type appears to be complicated due to third party tools that only recognize the existing types. I agree, the 'stars' is an enhancement over the 'points'. I believe that's a 'problem' with the current system. Caches from this point on would be DT rated for the cache only, not the challenge. So, no one would be doing a 5/1, yet only have it count as a 1/1; because the CO would rate it a 1/1. In this system, challenge stars, by definition, wouldn't count towards DT grid. Stars, as an enhancement over single points, being a measurable statistic, would likely incite further creative challenge ideas as well. Also agreed, simplicity is welcome across the board... in other threads I thought certain previous ideas were simple, but thinking through them programmatically, and considering various 'exceptions', I believe they'd be much more complex... I'm personally favouring the stars idea over others now because I think the benefits/improvements/enhancements and concerns addressed outweigh the technical implementation difficulty (which I think is actually even less difficult than some previous ideas). I honestly think that this system, being practically and conceptually a modular add-on to the system, as opposed to an intricate adjustment to existing code in numerous places, is the leading idea for a] addressing concerns raised from segments of the community regarding challenge caches, b] making terminology and geocaching concepts more self-explanatory and intuitive (eg meaning of "find"), and c] enhancing the challenge caching experience for those who enjoy the target and goal-oriented (dare I say competitive, for some, or numbers-oriented) nature of this aspect of caching. Even with the given drawbacks (learning curve, "change", design work required, growing pains, detractors, etc), I think it's best balance of all of the above so far, and the 'old' challenge caches method can easily be grandfathered, with even the same logging process effectively still doable with the new system. It even fits within an existing basic concept of geocaching... Difficult (brain) and Terrain (braun) stars; why not Challenge (goal) stars? Not to take this too far off the OP rails, but the idea of "Challenge Stars" could just be swung into the already-suggested new cache type. The only reason I mention it is that this ALR-cache type called "challenge caches" is still found under a physical cache heading of "Mystery/Puzzle". That physical cache type is like other physical cache types, in that one can log a find online once the logbook is signed by the user. Continuity, consistency, and clear messaging is the angle I'm taking on this topic. If it means creating "stars" for completing an associated challenge tagged onto a physical cache, so be it. But I think that Groundspeak can address the fact that all other physical caches are still following the fundamental process of "find it, sign it, log it online". Yet, they did away with all other ALR caches because of the uproar and general annoyance of the strange and unrelated "challenges" that cache owners created to restrict logging of their cache. To me that was a clear message from Groundspeak that ALRs were not "in the spirit" of location-based activities such as Geocaching on their Geocaching.com website. And yet, the "challenge cache" remains. The argument is that these "challenges" are positive, location-based, and attainable, and therefore allowable under the asterisk they've plugged into the depths of the Mystery/Unknown cache type. I liked some of the "ALRs" when they first came out. Things like "log this cache as found once you sign the logbook, and can prove that you've completed 100 challenges..." were, at the time, just an ALR. They weren't yet called "challenge caches", but many existed. Think of Delorme and fizzy challenges: those were ALRs which are now morphed into "challenge caches" as we call them today in the post-ALR-archival era. I want to see "challenge caches" continue. I agree that they are positive, fun, interesting (for the most part), and fundamentally location-based. However, I do not agree that they should be categorized with other physical cache types, as there are clear restrictions to the fundamental aspect of physical geocaching that is "find it, sign it, log it online." You can read the forums and uncover many spirited discussions about the fundamentals of the game. The primary fundamental thread between them all is that geocaching was, and really still should be, about finding a container, signing its logbook, and logging your find online. When this isn't the case, we are talking about adaptations to the core gameplay that we call Events, Earthcaches, Virtual Caches, WebCams, and the like. When there is an alternative way to log a "find" (WIGAS/Smiley), those cache types are apart in both icon, form, and guidelines. So I sit here and wonder why there is all the rancor from fizzymagic in the other thread, and the clear stand-offish approach from cezanne here when we are really talking about a way for "challenge caches" to continue, while keeping this game clear for new and existing users. Right now we have the Mystery/Puzzle cache type muddled by this buried asterisk of this one kind of ALR still wriggling around in the underbelly of the guidelines for Mystery/Puzzle caches. You see? Let's just compartmentalize and make things clearer for users. If there is a logbook, you should be allowed to log a find for when you find it, and sign the logbook. If there is an asterisk, be it no logbook or a hoop to jump through, then it should be apart from all other caches where all you need to do is find it and sign a logbook to have an undisputed online log (Find). Then we have Finds and WIGAS "finds" such as "Attended" or when you log a Virtual, WebCam or Earthcache. If it is a physical find you want to honor your challenge completion, then it should also be no problem if that physical cache is also loggable by anyone who finds that physical cache and signs the logbook. Otherwise you are just trying to make that cache a more important version of physical cache where only those who can jump through the proper hoops and prove it can log a find on a container they've found and logbook they've signed. If it is the honor of having done the challenge that is important, then it shouldn't be so contentious an idea that those who complete the challenge might get a separate, special honor for being the few and proud who have jumped through the hoops. It's not that big a jump to see how consistent presentation of the game by Groundspeak would benefit the game, and creation of a new cache type or new recognition process for challenge completion would be a pretty good (and cool) way to iron this all out.